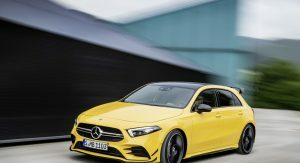 The Mercedes-AMG lineup is growing as the automaker has officially unveiled the A35 4MATIC. 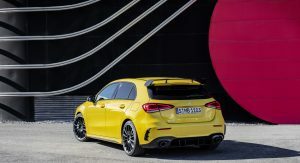 Starting under the hood, the hatchback has a new turbocharged 2.0-liter four-cylinder engine that produces 301 hp (225 kW / 306 PS) and 295 lb-ft (400 Nm) of torque. 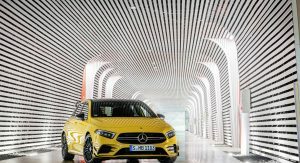 It is connected to a seven-speed dual-clutch transmission and a performance-oriented all-wheel drive system. 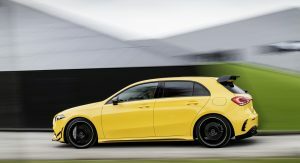 This setup enables the car to accelerate from 0-62 mph (0-100 km/h) in 4.7 seconds before hitting a limited top speed of 155 mph (250 km/h). 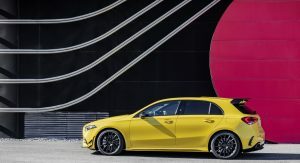 Being a proper AMG model means the performance upgrades extend beyond the engine compartment. 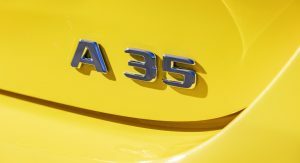 In particular, the A35 has been equipped with additional braces and an aluminum plate to increase torsional stiffness up front. 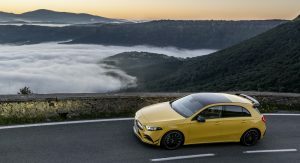 Elsewhere, engineers installed an AMG Ride Control suspension which uses lightweight aluminum components, an AMG-specific front steering knuckle and a handful of goodies lifted from the A45. 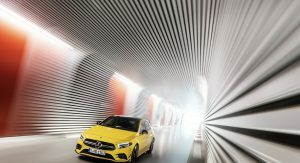 Customers will also have the option of ordering an Adaptive Damping System with three different modes. 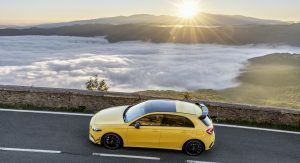 Since the model can get to high speeds relatively quickly, the A35 has been outfitted with a high-performance braking system that features four-piston fixed calipers and 13.7-inch (350mm) discs up front. Out back, there’s single piston calipers with 13-inch (330mm) discs. 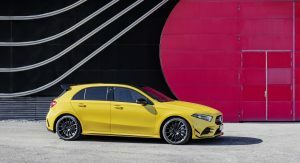 Other performance changes include a sports steering system, an AMG exhaust and an assortment of special settings including a new “Slippery” mode for the AMG Dynamic Select System. 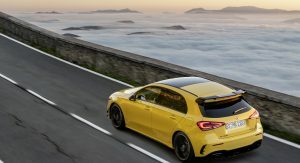 A previewed by leaked images, the A35 has a lot in common with the A-Class’ AMG Line variant. 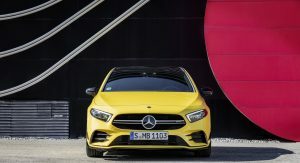 However, the mid-performance model has a unique grille, flics and a front splitter. 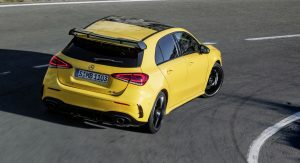 The car has also been equipped with a sportier rear bumper and a large spoiler. 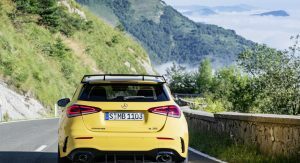 Other special touches include a new diffuser and 18-inch lightweight alloy wheels. Moving into the cabin, drivers will find a flat-bottomed steering wheel, microfiber accents and red contrast stitching. 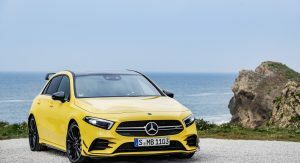 There will also be an assortment of AMG-specific settings and options for the digital instrument cluster and infotainment system. 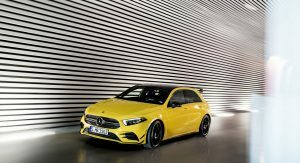 The Mercedes-AMG A35 4MATIC will be debut at the Paris Motor Show on October 2nd and sales will begin later that month. Already looked like a banana but now has the right colour. kinda racis t too say, isn¨t it? G O R G E O U S ! 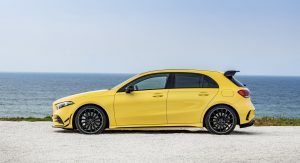 I wish that color had been available when I ordered my A250 AMG Line (it’s Polar White). 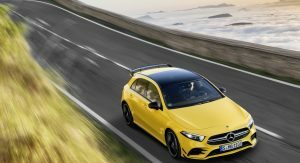 I’m very happy for you, but do you really have to mention in every comment that you ordered the A250? 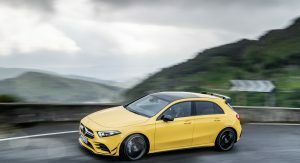 We will get the A35 Sedan and yes a GLA35 and even a GLB35 and then “45” variants of all those. 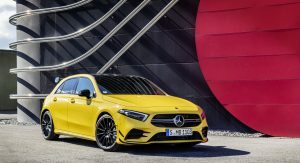 It actually looks pretty good in yellow. 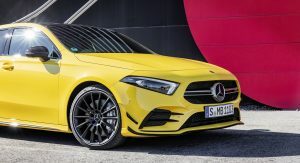 The lines on the car were a little too conservative for an entry-level Merc and the colour helps off-set that for the AMG model. 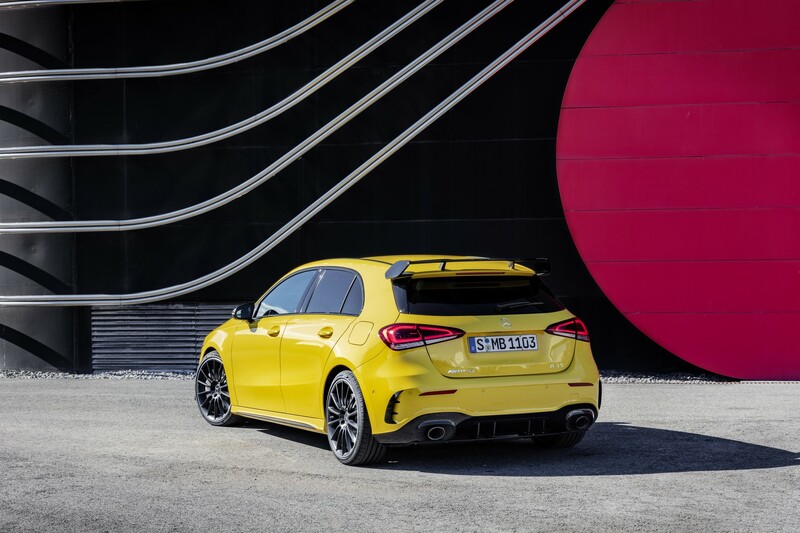 Looks like a sweet little hot-hatch. Not digging the integration of the screens in the dash. 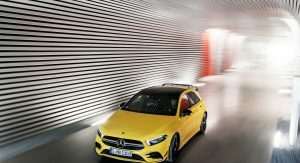 Looks more like an graphic designers office than a “cockpit” for any sporty driving machine. Also, GLA’s ergonomics weren’t great and it was a tight squeeze in there. Hopefully this new chassis lends a bit more spacious a feel for people in the car. It’s not that bad for a Benz. 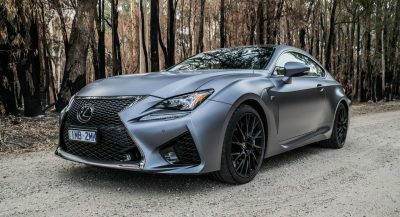 It would improve if it had 3 doors and a different color. 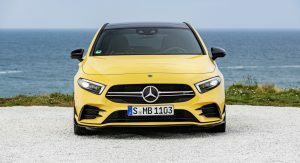 I still think this car looks like a failed facelift of the previous generation. 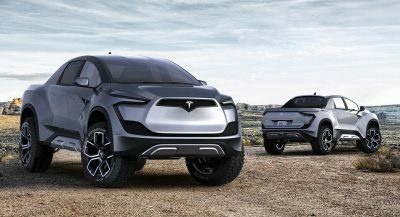 The front is atrocious and the rear could be from a Hyundai. 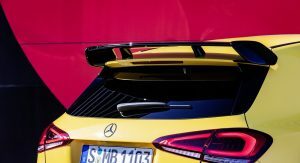 omg that tacky black spoiler/wing…..
Veeery interesting S3 competitor. Probably more desirable than the Audi. In a more subtle spec though. Really digging the way this turned out. A little surprised they basically matched the exact power output of the current S3. 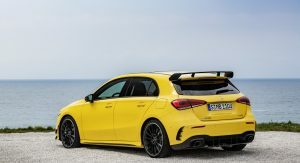 So why is BMW saying they can’t build a 1 series M (M1?) or X1M, X2M etc. 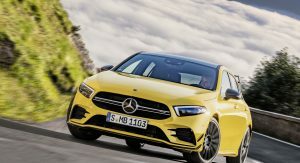 because of “front wheel drive” again? 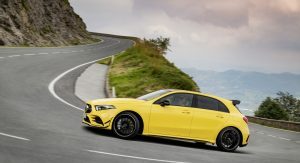 AMG is showing you can get around that with all wheel drive AWD, performance upgrades & tweaks, performance engine, enhanced driving dynamics and sporty handling. Over to you BMW. We imagine this pickup truck driver in Canada was left rather red-faced after this crash. 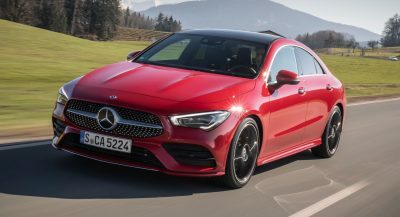 The second-gen CLA is certainly more stylish than its predecessor, but has it improved in other areas too?. This CX-7 driver came very close to taking out the cammer and a Toyota MR-2, then lost it and hit the median. 2020 Range Rover Evoque: Can It Trump The Audi Q3 And Volvo XC40? Premium compact SUVs have a familiar-looking, yet brand new challenger to the throne: the second-gen Evoque. You could buy this mint S800 for about the cost of a new Ford Fiesta in the UK. RBR team boss Christian Horner says Gasly must refine his driving style to get the best out of his ride. You Know You Want This 10K-Mile 1994 Supra Turbo – But Can You Afford It? This twin-turbo Supra seems to be in all original, and pretty fine, condition, but it has a six-figure price tag. If the Mercedes-Benz CLK GTR and AMG One had a baby, it could look like this. Only 38 units of the resurrected Vantage V12 Zagato will be made: 19 Coupés and 19 Speedsters. 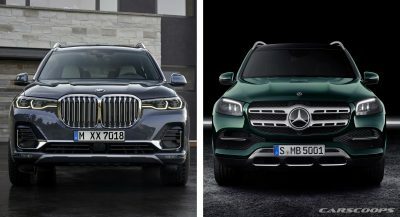 2020 Mercedes GLS Vs. 2019 BMW X7: Which Side Are You On?